When planning my recent trip to Europe in May, I spent hours researching the cities I'd be visiting, struggling to find all the info I was after in one place. As such I decided to put together my thoughts & recommendations into a brief travel guide for the next jet-setter. So here's my thoughts on what to do, eat, where to stay and what to experience while you're in Vienna plus a few other essentials that might be helpful, including a google map marked with everywhere I mention below, at the end of the post. Upon my arrival to Vienna, I was instantly gobsmacked by how beautiful it is. Lush green parks, decorative facades & architecture to rival Paris in the beauty stakes and spotless streets with an obvious sense of pride taken by the viennese in their capital city. While the viennese themselves are not overly talkative, they have a good dry sense of humour and are generally really friendly. If like me, you speak no German, the below should help you get by. And if case of being really stuck, get the Google Translate App. It's by far one the apps I used most during my trip, particularly when reading menus as it allows you to upload a picture of writing and the app scans & detects your chosen language before translating it instantly. Sprechen Sie Englisch? - Do you speak English? If like me, you only have a few nights in Vienna, I'd recommend staying within or as close to the innere stadt (the old city) as possible. This is where all the good stuff is and is also arguably the most beautiful part of the city. HeyMi Apartments Opernring via Booking.com. When I first arrive in a country after a long haul flight, I usually like to stay in a hotel but after finding this great little apartment on Booking.com, I decided to go against one of my travel rules and I am so glad I did. 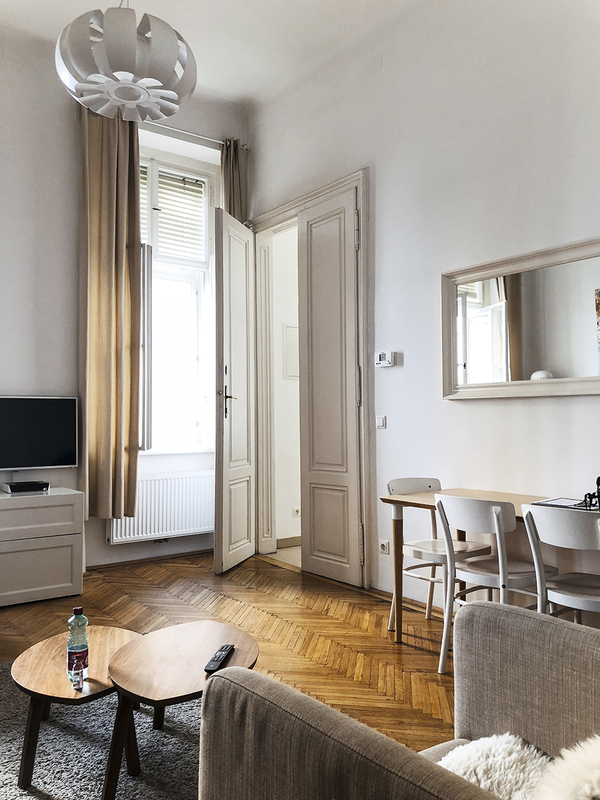 Our apartment was perfectly positioned opposite the Burggarten, on the corner of Eschenbachgasse and Opernring with a supermarket, Spar, just around the corner and all major attractions within walking distance. The apartment itself is accessible by lift (this is well worth ensuring, when booking anywhere in Europe unless you enjoy dragging your luggage up multiple flights of stairs), fully self-contained and really spacious with a kitchen, lounge, bathroom & laundry plus entrance foyer - approx. 45 square meters, which is huge by European standards. 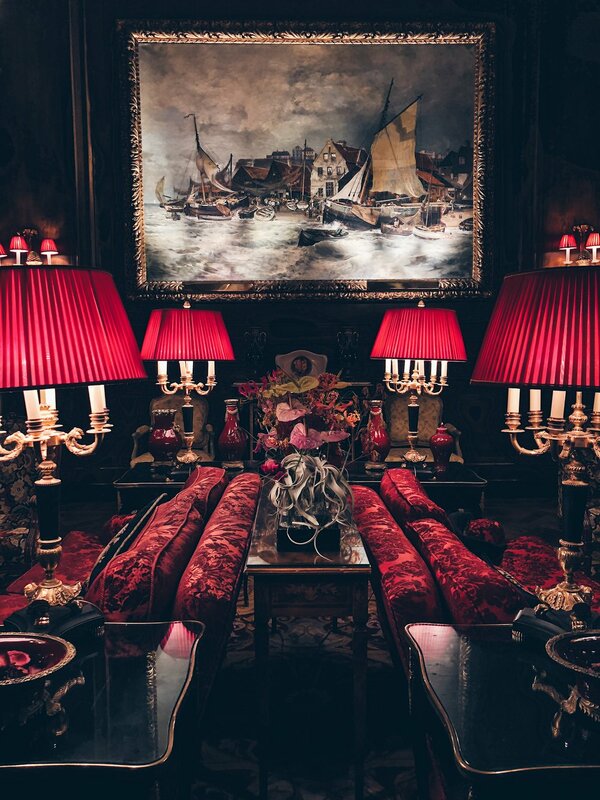 Hotel Sacher. If you want to splash out, Hotel Sacher is one of Vienna's oldest and most opulent five star hotels and has a number of luxe bars and restaurants at the venue, including the Blaue Bar, where we had the most delicious cocktails once night. 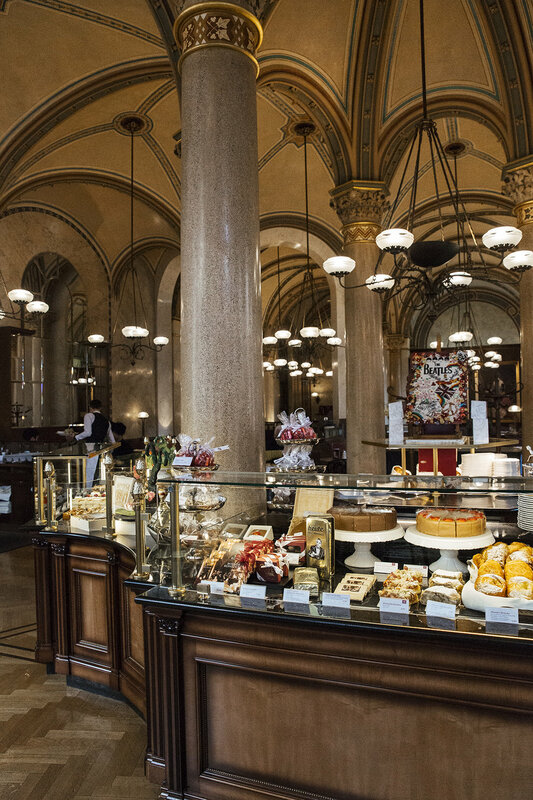 It's also home to Cafe Sacher Wien, one of the Vienna's most well known traditional cafes thats definitely worth a visit for the delicious pastries and luxe decor. Motel One. When I was researching accomodation, this hotel came up a lot, with rave reviews. Vienna can be a little on the expensive side and this hotel seems to be voted as one of the best value hotels in the area. Keep in mind that when I say value in this instance, I don't mean scummy motel - Motel One is still a plush hotel but seems to be a bit more affordable than most others in the area. It was fully booked when I was travelling, hence why I didn't stay there but for my next trip, I'll definitely be trying to book here. Zum Golden Wurstel. Ok so Austrian food might not have the cult following of say Italian or French, but it is mighty good nonetheless. Viennese Sausage, known as Würstel is outrageously delicious and the city is dotted with amazing Würstelständes, most of which also serve pretzels. I can't recommend the cheese kransky enough but the bratwurst is also a must-try. You've got the option of würstel in a round roll or sliced with toothpicks - always accompanied by horseradish and a beer though. And they're super cheap (here's another one we tried) and a good feed when you can't be bothered with a sit-down meal. Gasthaus Pöschel. 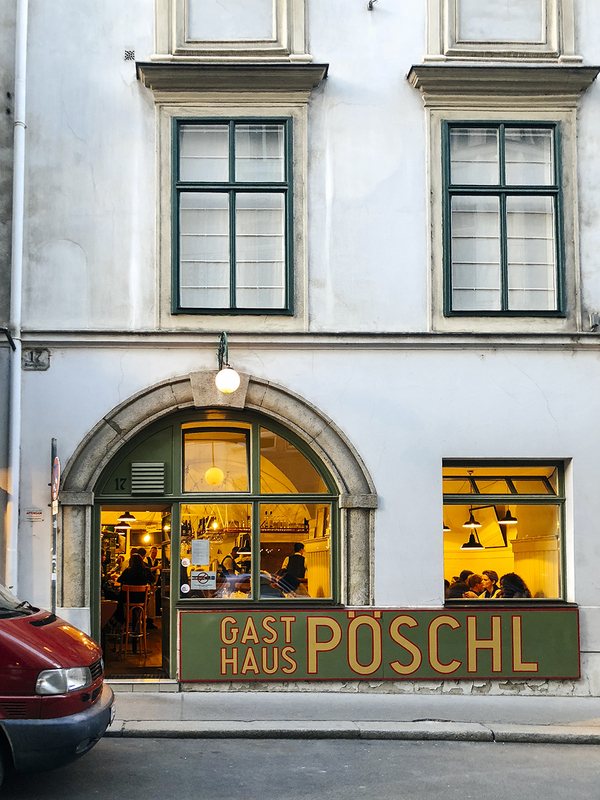 In search of more traditional Austrian cuisine, we sourced out Gasthaus Pöschel which serves local dishes, popular with the actual Viennese. It was here we ordered schnitzel and potato salad, and it did not disappoint. The schnitzel was as big as my head and so so delish. The potato salad, was more soup like in consistency that I'd expected and also really delicious. Accompanied by a smooth Gruner Veltliner (an Austrian white wine), this was easily one of my fav meals of the trip. Fabios. 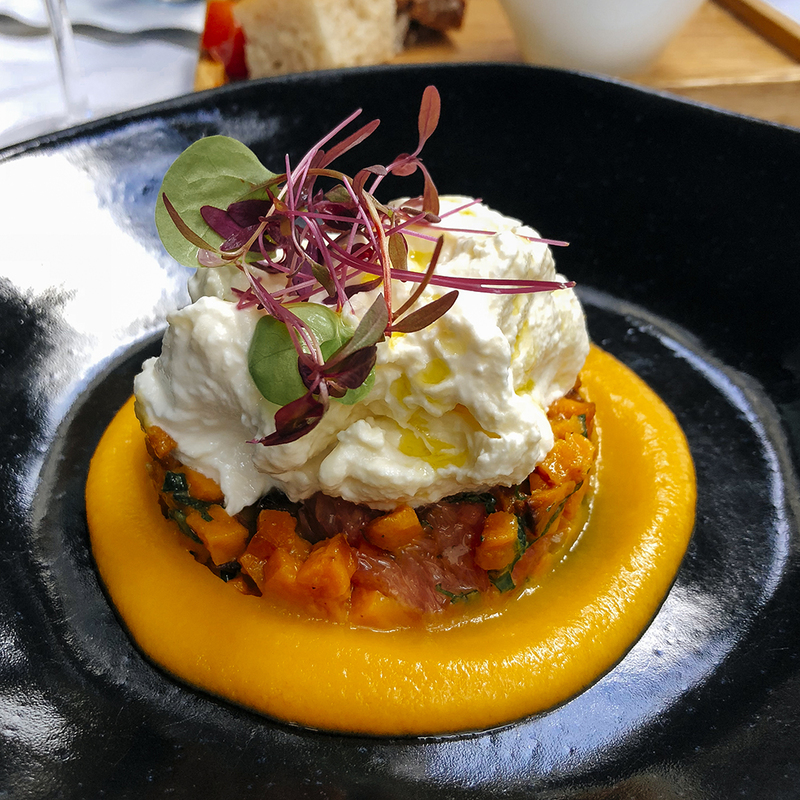 After an unsuccessful attempt at booking a table at Steirereck (that's ok, next time), we managed to score a table at Fabios, a slick restaurant surrounded by designer boutiques and impeccably dressed locals. The menu focuses on modern Italian meals and this was a meal I will not forget anytime soon. Chargrilled white asparagus, stracciatella (something I'm currently obsessed with) and bellinis to start with set me up perfectly for my mouth-watering Raviolini in marjoram butter main. No words. Ok, just one: Lush. 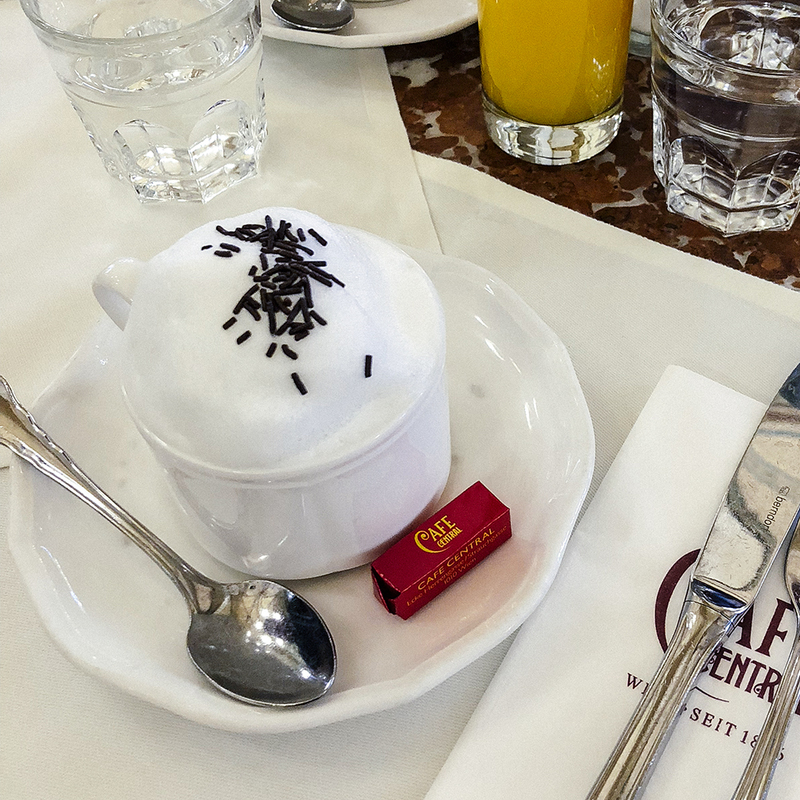 Despite the terrible coffee (yes, sorry I hate to break it to you, but the coffee in Vienna is average) Vienna is also well known for their traditional, old world coffee shops. We headed to Cafe Central for breakfast on the first day and indulged in a very tourist-driven continental breakfast. Including cold meats, cheese, a variety of breads, pastries and coffee & juice, this is a Euro standard, but the cafe itself is anything but standard. Cafe Sperl is another in this category that's also well worth a visit and get a Viennese coffee if you get a chance, you have to try one at least once. If you really need a homestyle hit, head to Joma - decent coffee and you can even get avocado and poached eggs on toast here. Palmenhaus Brasserie. This is the first place we went to after touching down in Vienna, and it definitely set the standard for the coming days, which is why we returned almost every day. It's so pretty and v insta-friendly. We'd sit at one of the tables on the terrace that overlook the Burggarten gardens, order a gin and tonic (they serve Fever Tree tonic - win) and indulge in a strudel while watching the unique mix of tourists and locals go about their day. 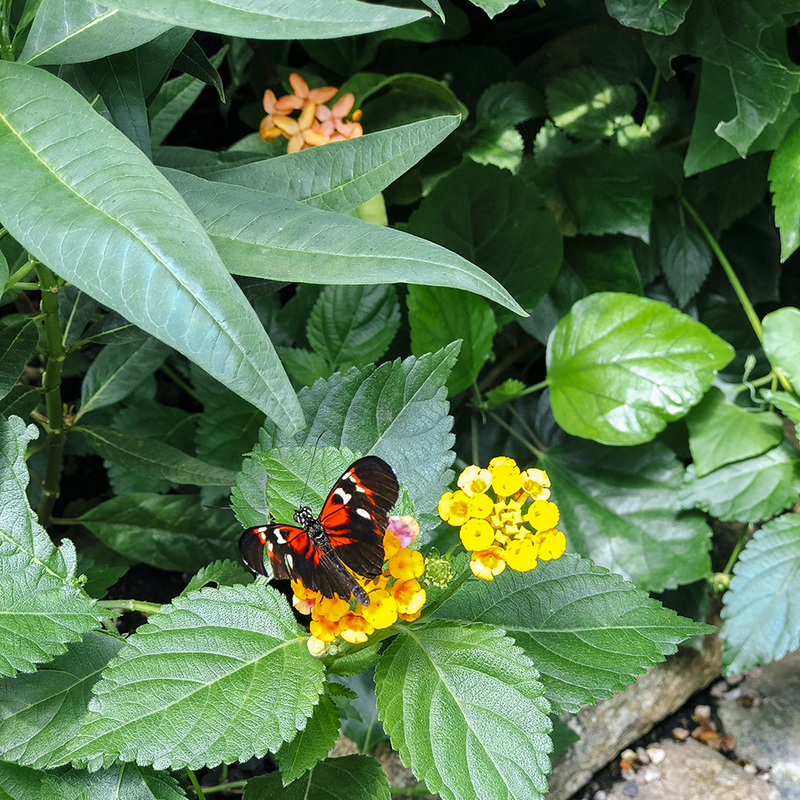 The butterfly is literally nextdoor, and for 6 euros, also worth a visit. Wiener Staatsoper. 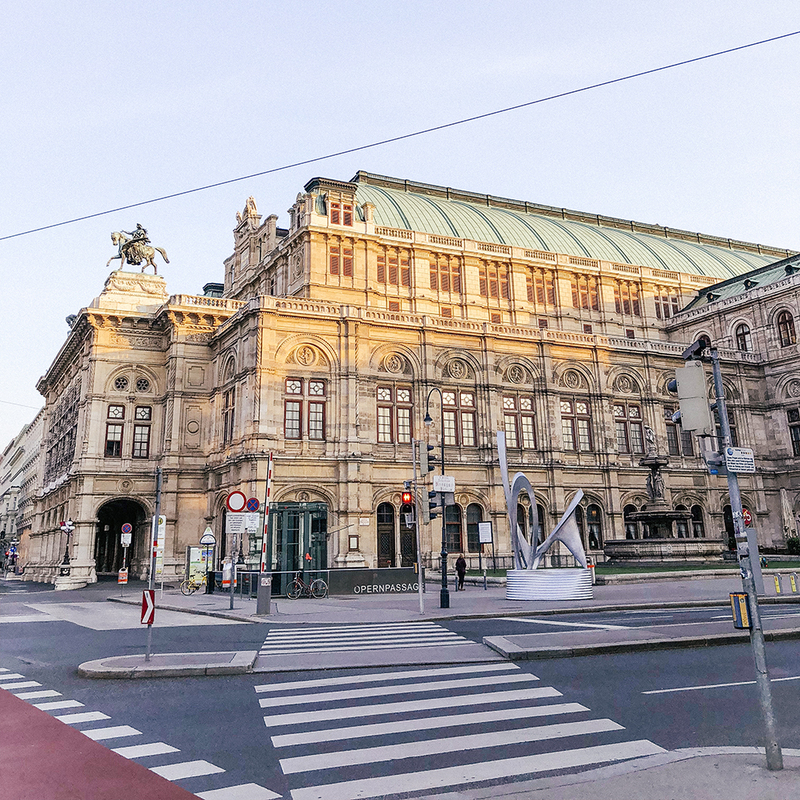 While you could splurge on a ticket to a show at the famous Wiener Staatsoper (Vienna State Opera) you could also do what we did, and watch the show al fresco. Thanks to a large screen mounted to the Kärntner Strabe side of the building, passers by can pull up a deckchair and enjoy the show which is projected live onto the screen each night. The best part about this, is the beautiful sound that fills the air as you wander through nearby streets - sehr romantic! The Leopold Museum. For a hit of culture, we went to the Leopold Museum and I was super surprised to find pieces from some of my favourite artists including Magritte, Warhol and Picasso. Unlike some other major city galleries, the Leopold is great because it doesn't require a full day for a visit, we were in and out in just over an hour. And given how good the weather was (26 degrees & sunny every day) we grabbed a drink and played a round of Mini Golf out the front of the gallery before we left. And I lost. By one point, but who's counting. HOW LONG - We stayed four nights and I'd recommend no less and probably no more than a week. Keep in mind shops close on Sundays & public holidays, so avoid long weekends there. ARRIVED BY - Plane. Flew Emirates into Vienna via Dubai. GET AROUND - Taxis are reliable, but take the tram if you're not going far. SHOPPING - Shopping was much better than expected. 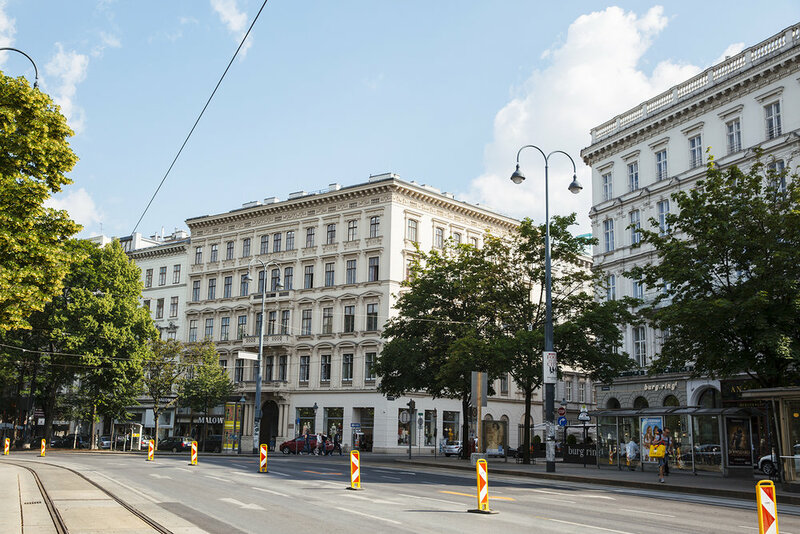 Kärntner Straße is the main shopping strip and has all your high end and high street favs. The Mango store on this strip is especially good. AIRPORT - Is approximately 30-40 mins (no traffic) from centre of Vienna. TRAIN STATION - 10 euro, 10 minute cab ride to the centre of Vienna. PEOPLE - Initially, they're not so talkative, but when you do get them talking they're all super friendly. They're also really well dressed. WOULD I GO BACK? Absolutely. But next time when it's cold, ideally just before Christmas.